Guns and bullets - (Google Photo). 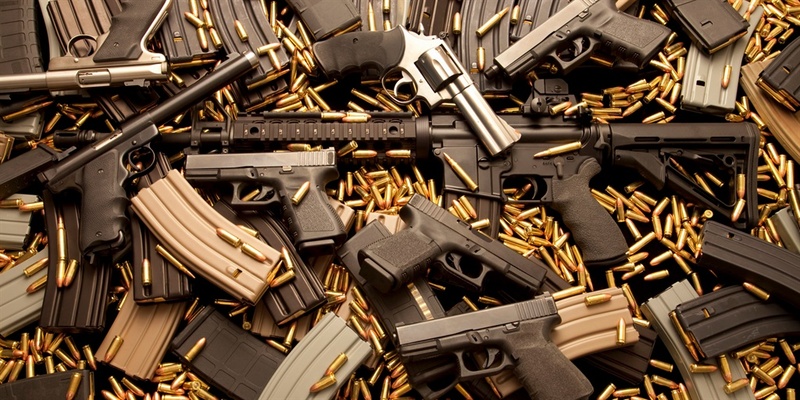 The Acting Inspector General of Police, Mr Mohammed Adamu, has announced a mop up of illegal arms in Nigeria, in what now appears as a routine before elections. Boko Haram members have so many unregistered guns and they have chased over 78,000 people out of their homes between November and now, according to a Untied Nations; agency. Police needed to take action about some arms flying about used for crimes against humanity. To push this further, the Acting Inspector General of Police ( IG), Mr Mohammed Adamu, has placed with immediate effect, embargo on the issuance of new licences for designated arms throughout the country. The acting spokesman for the Nigeria Police Force, Frank Mba, announced the new plan in statement on Sunday in Abuja. Mba, who did not list the categories of the arms, called on Nigerians in unlawful possession of such weapons to return them to Police Stations or Public Armoury nearest to them. Mba said the decision followed the proliferation of illicit weapons and the desire by some citizens to acquire more arms. He said Adamu advised Nigerians to take advantage of the “voluntary arms return window” and do the right thing, as there will be dire consequences for defaulters. The spokesman said that the force has perfected plans to embark on a massive, nationwide Joint Arms Mopping up Operations. He said the operation which would be intelligent driven and target oriented, was designed to retrieve all illicit weapons in circulation. Mba said that the excuse would halt the on-going proliferation of weapons, restore law and order and bring perpetrators to justice. It is not the first time that the police are announcing arms mop up, but after several mop ups in the past, crimes and more crimes have been committed with unregistered arms. Almost around this time in 2018 the same thing happened when the immediate past IG, Mr Ibrahim Idris, ordered a mop up of illegal and unauthorised arms from across the country. Is it just a formality ahead of election? Arms have continued to come into Nigeria. Some of the arms have come in through the border that security personnel man.